Livestock guardian dogs (LGDs) are dogs that are purpose-bred for living with the flocks they guard, to reduce predation. For hundreds of years, these rugged animals have lived outside with sheep, year round, withstanding harsh elements. They use the same shelter as the sheep and get extra feed in winter. As a result, LGDs do not require a doghouse but may require some extra care when guarding the ewe flock in winter. Keeping them with the sheep provides the livestock with protection against wolves, coyotes and other dogs. An LGD is bonded to the flock it lives with and should want to stay with the ewes. Shepherds say the dog thinks it is a sheep. Researchers believe the LGD is treating the sheep as if they were other dogs, and the sheep are treating the dogs as if they were other sheep. The flock of sheep and dogs together respond to each other’s feeding behaviour and alarm signals. Behaviour born of centuries of selection for certain traits means LGDs are less likely to kill a sheep and are predisposed to follow their flock. trustworthy – They will not endanger the sheep they are charged to protect. attentive – LGDs stay with the flock and do not roam away. Professors Ray and Lorna Coppinger studied 1,000 LGDs for over 10 years and ran the Livestock Dog Project. According to Ray Coppinger, whether dogs can sleep outside depends on the weight of the dog. Large dogs have less trouble handling the cold of our winters than the heat of our summers. Dogs are poor at radiating heat but good at conserving their heat. Sheep may require access to shelter, such as barns or stands of bush, during winter rain storms. In contrast, LGD breeds generally have a long, flat, weather-resistant outer coat that sheds water, and a thick, “downy” undercoat for warmth. Rough-coated, undercoated, short-eared dogs can withstand lower temperatures than smooth-coated, greyhound-shaped dogs. However, according to Prof. Coppinger, it is body mass that really determines cold resistance in dogs. At about -32°C, medium-sized dogs (under 32 kg) start to take action against the cold by shivering or increasing their metabolic rate (burning energy to produce heat). 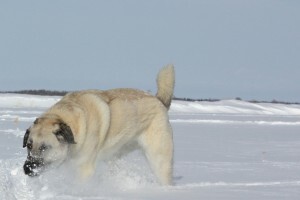 Larger dogs, such as LGDs that weigh around 45 kg, can withstand even lower temperatures before reacting to the cold. Doghouses have been placed in summer pastures by Western U.S. open range ranchers (pasturing sheep in areas where there are no fences) to provide a home site and feeding station for the dogs. They place a salt lick on the back of the doghouse to attract the sheep to this area so the doghouse becomes a socializing point for the sheep and dogs, helping reduce roaming. Respondents to the Ontario livestock guardian dogs survey conducted through the Large Flock Operators (LFO) working group in 2003 commented that their older dogs would seek shelter from the cold rain. Others stated their dogs would sleep outside the pole barns, while the sheep slept inside. Of the LFOs surveyed, those that supplied a doghouse for their LGDs stated that the dogs never used the doghouse, and that they always slept outside. Full-fleeced sheep that are healthy and properly fed can spend the winter outside without access to a barn. Sheep and livestock guardian dogs require a windbreak for very cold, windy days. A windbreak may take the form of a bush that can be around the outside of the field to block the wind or in the field, allowing sheep to enter it for shelter. Wooden windbreak fences looking like tall snow fences, or made of partially porous windbreak “cloth,” can provide adequate wind shelter for sheep and the dog. Sheep will also use each other as shelter from the wind. When a sheep on the windy side becomes cold, it moves and works itself into the centre of the flock. LGDs will do the same, burrowing into the centre of the flock if they want to get out of the wind. LGDs will lay in the fence row of a field, using the shrubs and snow banks for shelter. Dogs have been seen lying on top of the round bales of hay in a feeder. If large round bales are unrolled for feeding, the dogs will lie on the hay. According to the LGD owners survey, shepherds increased the amount of feed offered to the dogs during extremely cold weather and/or increased the fat/energy content of the feed during the winter months. Some sheep producers have self-feeders available for the dogs, allowing the dog to decide if and when it requires more feed. Since these dogs often choose to stay outdoors in all weather conditions, their metabolic action may increase in response to severe weather, causing them to need more feed. One dog food manufacturer suggests that dogs need about 7.5% more feed for every 5.5°C drop in temperature, once the temperature reaches the point were the livestock guardian dogs is shivering or trying to avoid the cold. When coyotes are pressuring a flock and “working” the LGDs, the dogs often lose some weight. Some shepherds change dog feed to a higher energy feed during these times of the year. The National Research Council reported in Nutrient Requirements of Dogs that “Requirements for work and adverse environmental conditions make a . . . systematic schedule for meeting such diverse requirements impractical. Thus, it is recommended to feed to thrifty body condition . . . reliable sign of uncomplicated energy deficiency is generalized loss of bodyweight.” In other words, a dog losing weight needs more feed or a higher energy feed. 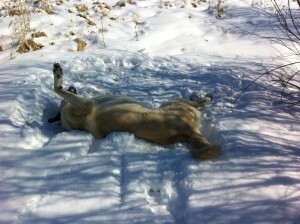 Especially during harsh weather, check the body condition of your LGDs. Some shepherds check daily, some formally score the dogs’ body condition several times each year. To do this, place both thumbs on the dog’s backbone and run the fingers along the rib cage. 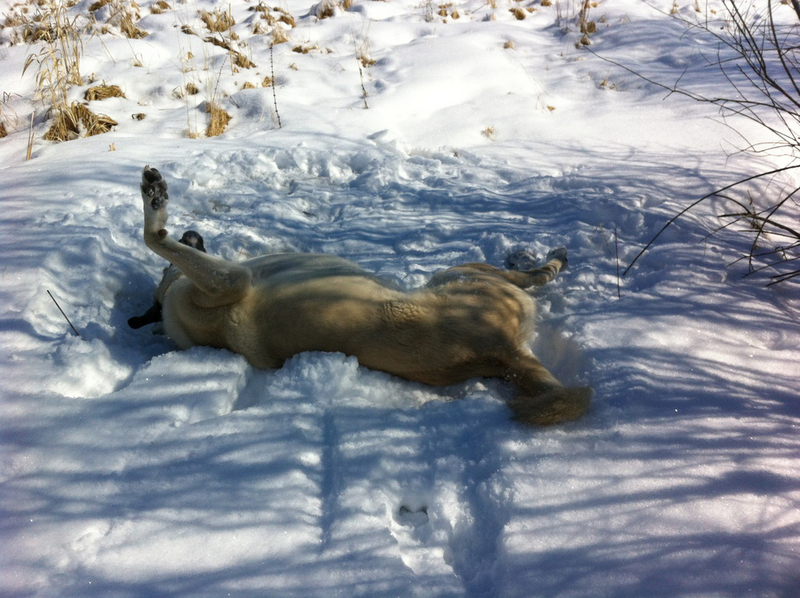 You should be able to feel the dog’s ribs – an livestock guardian dogs should not be fat. If you cannot easily feel the bony part of each rib, the dog may be overweight. When viewed from above, looking down on to the dog’s back, a clearly defined waist should be visible behind the ribs. From the side, the abdomen should appear tucked up. The longevity of working dogs is dependent upon their life span and whether they show the appropriate guarding behaviour. The Livestock Dog Project run by the Coppingers found that 11% of dogs culled were inattentive to livestock and 57% had injured or killed livestock. The longer a dog stays on the farm, the more cost-effective it will be for the shepherd. The purchase price, training costs and ineffective juvenile months will be amortized over a much longer time period. Livestock guardian dogs are adaptive and can make changes to their routine as conditions change. 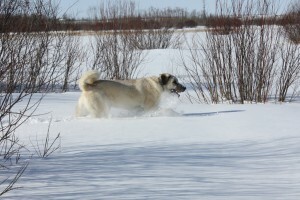 In Ontario, LGDs are not tethered and can make their own choices and changes to their microclimate as the need arises. Using the same shelter as the sheep it protects, a properly fed, well-conditioned LGD does not require a traditional doghouse. I would have a little more knowledge and access to possible maintenance practices in order copies as the guardian of the flock. What would be the cost for semiannual maintenance of a couple of this breed really working with domestic creations in a small space in 1ha? What would be the cost for the purchase of books and guides maintenance breed and activity flock guardian, if possible consisting delivery costs in the city of Curitiba in Paraná State, Brazil. I am a biologist and develop some tests to aversive stimuli as against pradadores wild and the occurrence of predation on domestic livestock. I am awaiting information and thanks for listening.